If you want maximum control over light and privacy, then out Top-Down, Bottom-Up Trilite™ Pleated blinds are the perfect choice. These innovative blinds allow you to cover your window completely, partially or not at all. And as the name suggests, you can draw these blinds up from the bottom of your window for extra privacy, while allowing sunlight to come in through the top window section. Request an in-home appointment and discover our range for yourself. 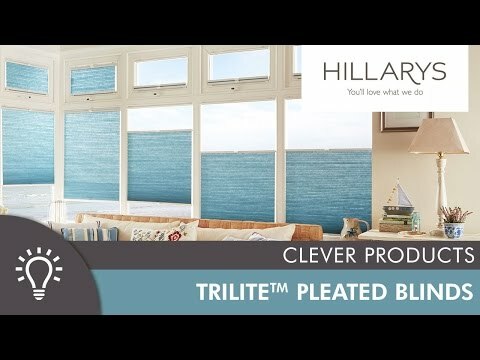 Our clever Trilite™ Top-Down, Bottom-Up Pleated blinds offer the ultimate control over light and privacy. The innovative, cordless design means that the blinds can be pulled down and closed using tabs in the standard way. But unlike classic Pleated blinds, they can also be pulled up from the bottom, allowing you to easily position the blind anywhere in the window. The ‘Bottom-up’ solution is ideal for any rooms that are overlooked, as it allows lots of lovely sunlight to filter into the space, while keeping prying eyes out. And the overall effect mirrors that of our Cafe Style shutters, giving your home a continental feel. With the full range of Pleated blinds to choose from, including specialist blackout, reflective and sheer options available, there’s a fabric for every space. Choose a light colour to create a soft glow at your window, adding warmth to your room, or create a private haven in a bedroom with a blackout fabric. Request an in-home appointment to see the full range and get expert advice from our specialist advisors. As well as talking you through all the options, we’ll measure your conservatory and return to fit your made-to-measure blinds for a perfect finish – all as part of our standard service.